Good Magic, the reigning Breeders' Cup Juvenile winner, won't take his turn at a second victory in the championships after the Daily Racing Form reported the colt is done racing for the year. Trainer Chad Brown told DRF's David Grening that Good Magic "needs some time," and that "a decision on his future will be made in the coming weeks." Good Magic struck in graded stakes twice this year, winning Keeneland's Blue Grass (G2) and Monmouth's Haskell Invitational (G1). 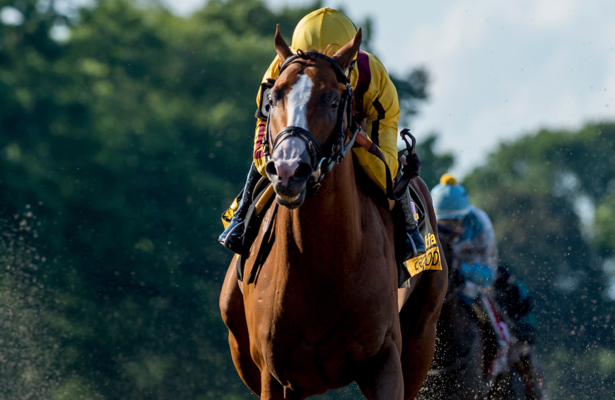 But two races after returning from the Triple Crown series, he was ninth as the Travers Stakes (G1) favorite, then promptly sent to the farm for further evaluation. Stonestreet Stables and e Five Thoroughbreds campaign the son of Curlin, who was also second in the Kentucky Derby and fourth in the Preakness Stakes. Given the connections, he's surely a stallion prospect, but e Five's Bob Edwards has also expressed an interest in racing Good Magic at age 4. In all, the horse sports a record of 3-3-1 in nine career starts with earnings of $2.9 million. Brown's barn could still take a shot at the Breeders' Cup Classic with Instilled Regard, who runs in Saturday's Pennsylvania Derby, or Gronkowski, who will face older competition Sept. 29 in the Jockey Club Gold Cup at Belmont Park.